The Molecular Imaging & Translational Research Program (MITRP) is a multidisciplinary group of researchers that serve to bring together diverse groups from clinical & preclinical. This MITRP is jointly positioned in the Department of Radiology within the University of Tennessee Medical Center and the University of Tennessee Graduate School of Medicine. This relationship creates an effective bridge between the clinicians and researchers. Our group is also involved in the new University of Tennessee: Institute for Biomedical Engineering (iBME) as core faculty, planning committee members and program coordinators for this exciting new collaborative research venture. Our program is overseen by Dr. Laura Findeiss, Chair of the Department of Radiology and Dr. Mitchell Goldman, Chair of the Department of Surgery and Assistant Dean for Research for the Graduate School of Medicine. Our group is composed of three primary components: clinical, preclinical, and translational research. Clinical research efforts, headed by Dustin Osborne, Ph.D., Assistant Professor, focus on building collaborative efforts between physicians and scientists to develop new imaging technologies and applications that improve clinical outcomes and the quality of patient care. Specifically, we are interested in developing new applications for existing FDA and non-FDA approved imaging compounds that may help in the diagnosis or treatment of cancer or amyloid-related disorders. Clinical research efforts are supported by our clinical research leader and nuclear medicine technologist, Shelley Wilson, CNMT, RT(R) and the Department of Radiology. The basic and applied Preclinical Imaging Research focuses principally on the development and characterization of novel radiotracers for the detection of amyloidosis and cancer. A team of multi-disciplinary scientists led Professor Jonathan Wall and Associate Professor Stephen Kennel supports the NIH-funded research into amyloid-reactive peptides that are being developed for the future diagnosis and therapy of rare but devastating amyloid-related diseases and cancers. The imaging lab has developed productive relationships with researchers at Oak Ridge National Laboratory, UTK and the UT Veterinary Medical Center and provide resources for collaborative research projects. The research efforts are supported by Alan Stuckey, BA, CNMT, preclinical research leader, who operates the imaging devices and manages the lab, Tina Richey, MS, who is the expert in animal model development and compliance, Emily Martin, BS and Angela Williams, MS with expertise in biological radiotracer development. Our translational research efforts are directed by Amy LeBlanc, DVM, Associate Professor, Department of Veterinary Medicine. Establishing a strong translational research initiative is an essential part of the MITRP mission. The goal of our translational research program is to bridge the gap between small animal models and the imaging of clinical patients and to foster strong collaborative relationships with the Veterinary School. Both the preclinical and clinical efforts are supported by a dedicated radiochemistry group directed by George Kabalka, Ph.D. and Murth Akula, Ph.D. This group has over 20 years of PET chemistry experience and was instrumental in the development of mainstream clinical PET usage. Administrative support is provided by Melissa Weaver who has been with the University of Tennessee Medical Center forÂ and has experience in administrative functions as well as medical billing and precertification procedures. 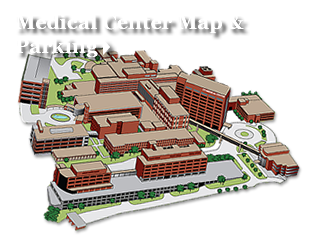 Our clinical research facilities are housed in the state of the art University of Tennessee Medical Center Cancer Institute that opened in September 2012. Our facilities include dedicated imaging and control suites, injection room and a three-patient post-injection waiting area. 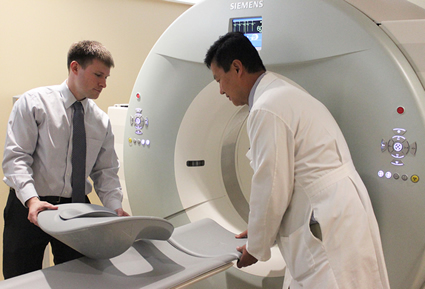 This facility is a joint effort of the Graduate School of Medicine and University Health Systems where our dedicated research staff work hand-in-hand with our clinical imaging staff to provide the best possible patient experience and the most advanced imaging technology. Our clinical imaging capabilities include a state of the art Biograph mCT Flow. This unit is a 64-slice CT with 4-ring PET equipped with state of the art processing capabilities such as point spread function reconstruction (HD-PET) and time of flight (UltraHD-PET) for the finest diagnostic image quality and advanced features such as HD-Chest that enables high resolution imaging of patients even in the presence of motion. This scanner is also equipped with new FlowMotion technology that enables continuous bed motion acquisition that improves patient workflow, reduces dose and enables disease-specific imaging. The 2,800 sq ft. Preclinical and Diagnostic Molecular Imaging Laboratory includes four imaging suites, an AAALAC-I-accredited animal holding satellite facility with individual areas to house multiple species. Radiochemistry facilities are available as well as laboratory workspaces for animal manipulations. A dedicated data analysis and storage suite offers various image analysis software options and servers for data management and archiving. This facility is a $600,000 dedicated imaging laboratory opened in 2005 designed as a luminary site to support external site visits to the facility. Preclinical imaging capabilities includes a state of the art Inveon Trimodal platform for small animal imaging. This system includes PET, SPECT and CT imaging capabilities in a single gantry. The PET platform is a 4-ring system with 1mm resolution using MAP reconstruction andÂ up to 10% sensitivity. The SPECT platform has application-specific multi-pinhole collimators with 0.8 mm resolution. The CT platform is capable of < 20 micron resolution and is mounted on automated stages for easily changing between high resolution and fast anatomical imaging. In addition to the preclinical imaging facilities, a 6-slice Biograph TruePoint PET/CT is installed for use with larger animal models and clinical research studies that may not require 64-slice diagnostic CT. This facility also includes a hot cell for working with radioactive compounds and formulating patient doses of radiolabeled compounds. Dr. Kabalka's group occupies two fully equipped radiochemistry laboratories in the Biomedical Imaging Center is located in the Department of Radiology of The University of Tennessee Medical Center. These facilities are overseen by Murth Akula, PhD. The laboratories are equipped with three vonGalen hot cells, a Capintec Radioiosotope Calibrator Model CRC-127R, a Bioscan, Autochanger 300 radio-TLC system, and a Waters HPLC fitted with UV, RI and radiation detectors. Two chemistry laboratories are also occupied by the group.Â The laboratories house a complement of equipment including fume hoods, electronic balances, analytical HPLC units fitted with radiodetectors, radio-TLC units, and gas chromatographs.